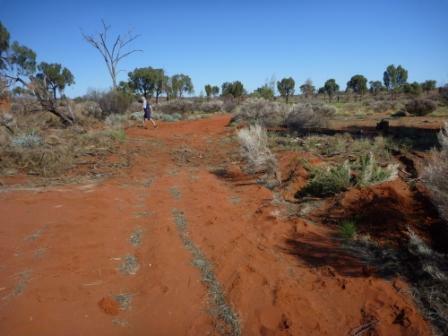 Over the years we have had many questions about the state of the western desert road network. It is hard to describe to folk just what the tracks are like as the conditions change with the different types of country. As well, peoples perceptions about track conditions also vary greatly, what one person thinks is terrible, another will think nothing of. To illustrate the worst of the road conditions we have put together a number of images from the last couple of years. From this you can make up your own mind. 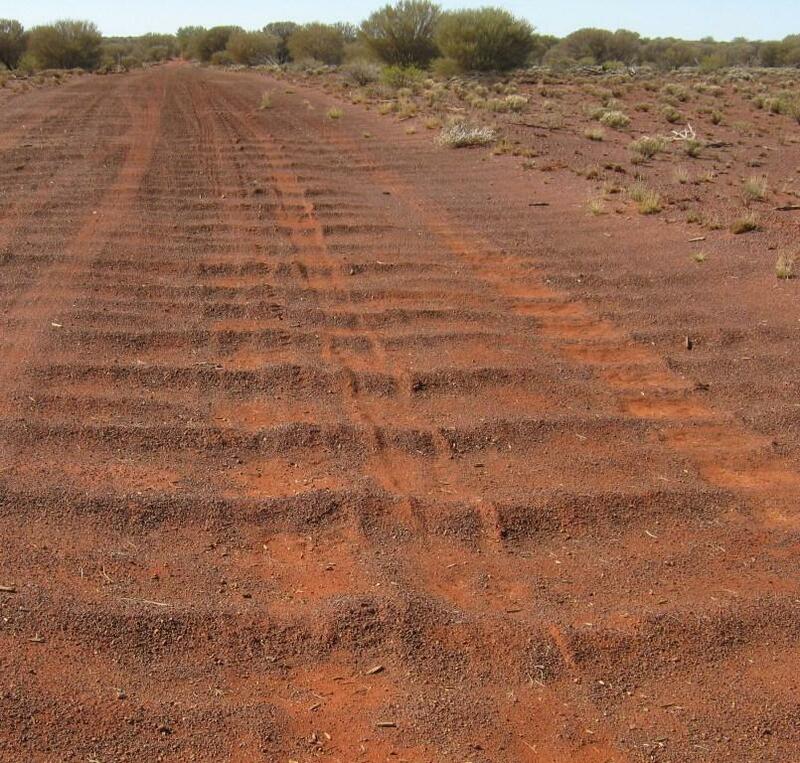 The most complained about condition on any gravel road, dirt track or sandy wheel-track would have to be corrugations. Just the word conjures up the images of teeth rattling vibrations and boiling shock absorbers. 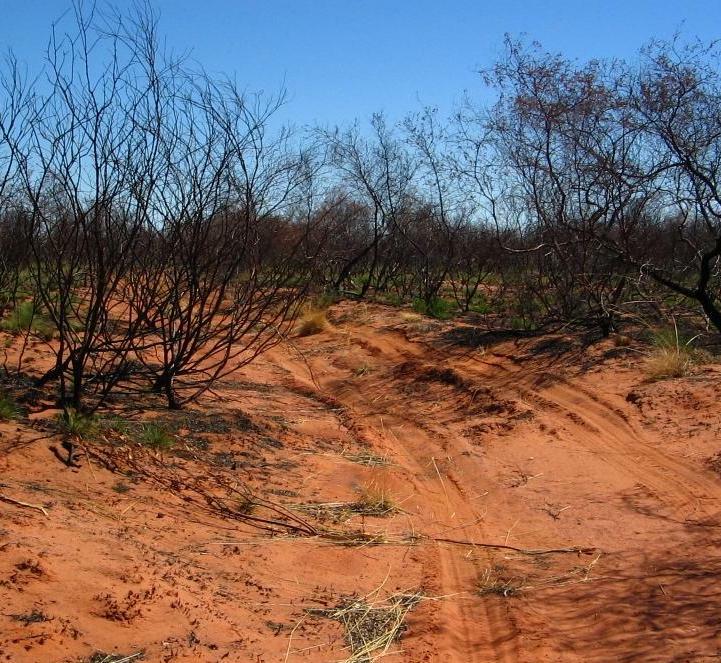 No matter where you go in the western deserts you will have to contend with corrugations, some small, some large, sometimes for short distances and other times for what may add up to hundreds of kilometres. 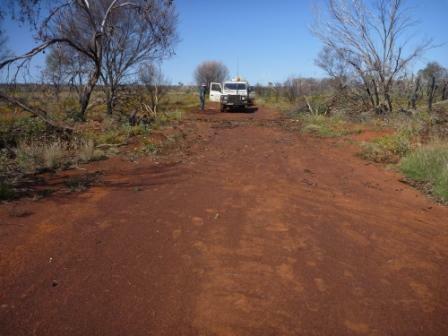 Ironstone gravel corrugations – usually the worst type - 2013. 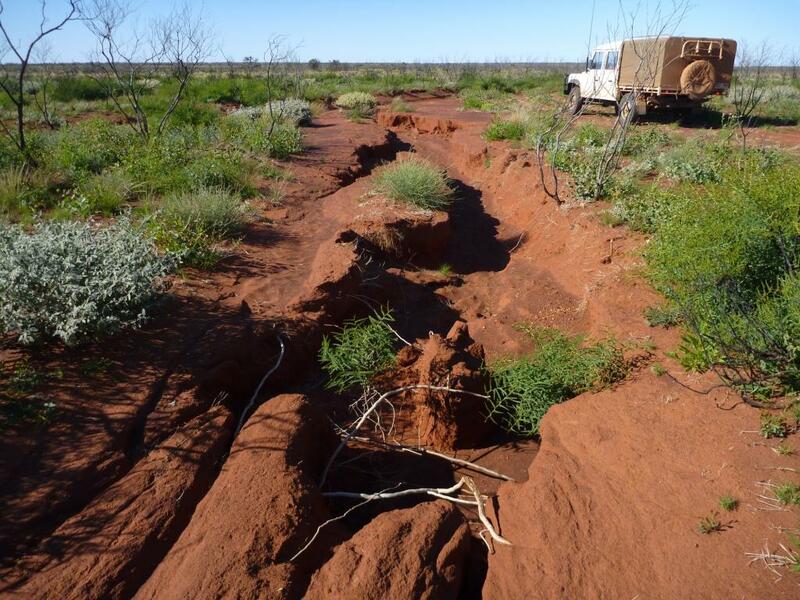 Water damage to roads & tracks in the western deserts is very common and widespread. 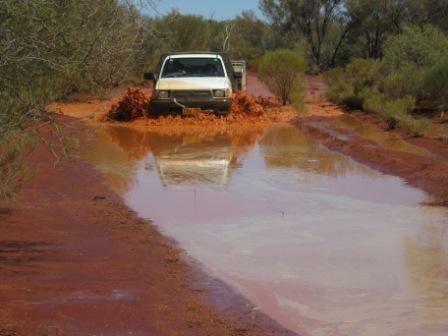 Along some of the older roads washouts are the main problem travellers have to face. Summer storm events often dump huge amounts of water which has to run somewhere in a hurry so usually the roads turn into creeks. As the original roads and even some of the later ones were never cut to drain the water off, huge channels have eroded into the roads, some are very old & massive. Most of these larger obstacles have well worn detours around them. Most of the minor washouts do not. It pays to be cautious when driving in unfamiliar territory. It is advisable to go around these, not through them......2013. Things can get awkward if you are not careful - 2008. 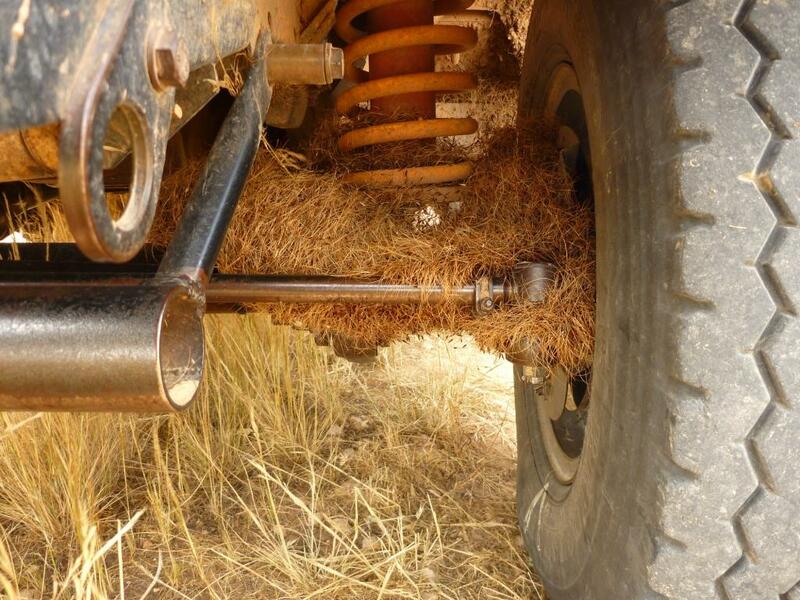 Another problem encountered in the western deserts is the building up of grass stalks underneath the vehicle and seeds in the radiator. 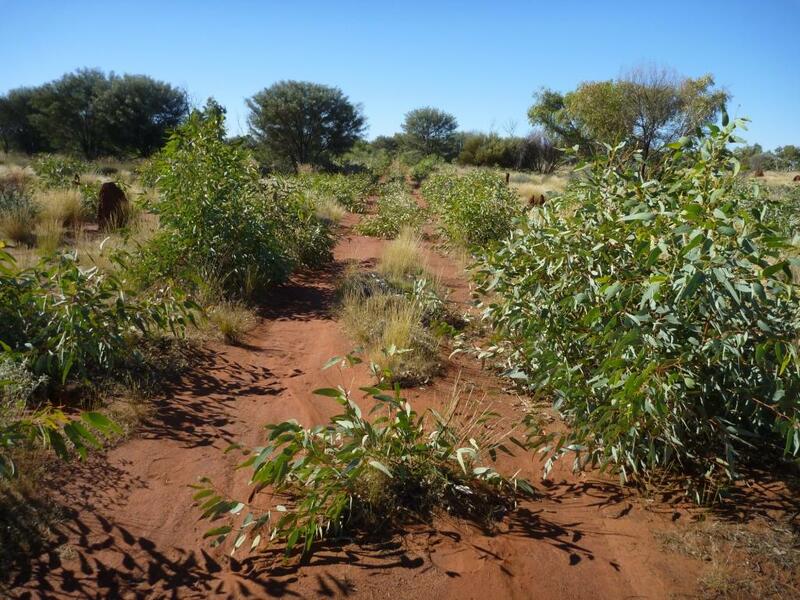 This problem can also surface from other grass varieties, but when you think of this issue, spinifex always comes to mind and rightly so. It is very surprising where debris will get in.......2011. Bulk grass seed, it doesn’t happen often, but when it does be very very careful - 2011. Getting your vehicle paint scratched from sharp scrub seems to fill quite a few people with various levels of terror. Personally I’m more worried about the bigger picture, will the vehicle keep going mechanically & electrically......Paintwork is way down on my list of worries, (in fact it is down near the fridge & we don’t carry one). 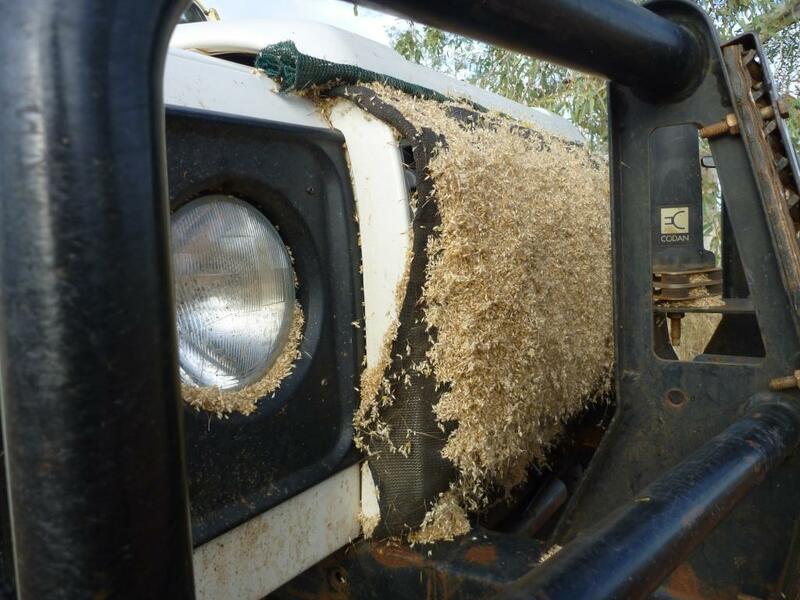 In the western deserts if you don’t want to give your paintwork a rub now & again we suggest you stay on the major roads that see a grader now & again or a lot of traffic. 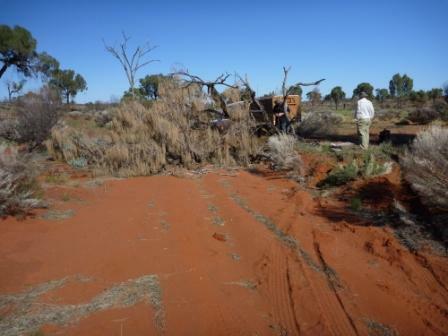 Close scrub that has been burnt – the worst for scratching vehicles - 2007. Tracks that don’t get used can grow over very quick, this is the Eagle Highway in 2013. 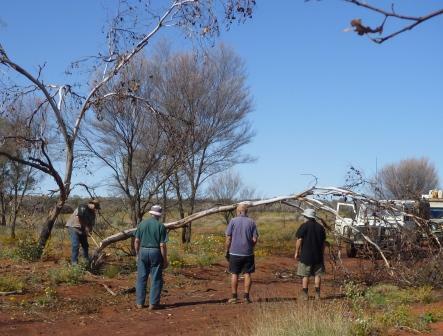 This problem we find quite often, you come along and find branches, limbs and sometimes full trees over the track and it is extremely annoying to find every bugger before you has just driven around it creating a detour. 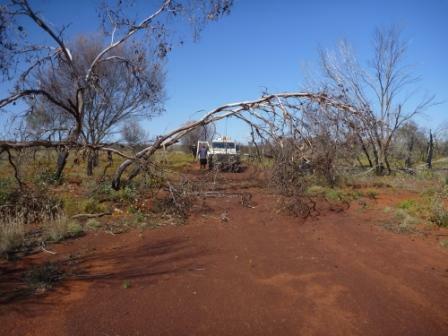 More annoying is when you find out it was a 4WD club trip (visitor books) and the participants were too lazy or in a hurry and did nothing about clearing the road. Mallee over road - September 2013. Busy with the axe. Connie Sue Highway – that’s better. Desert Oak over Old Gunbarrel – June 2013. Pulled off with vehicle & cleaned up by hand. Took about 15 minutes to do this. Despite being so-called deserts you will find that a fair amount of rain falls now & again, at times it can be torrential. Often the roads will have a lot of water over them for many weeks or longer. There is not much you can do about this. If the rain is recent you will be better sticking to the road or wheeltracks. 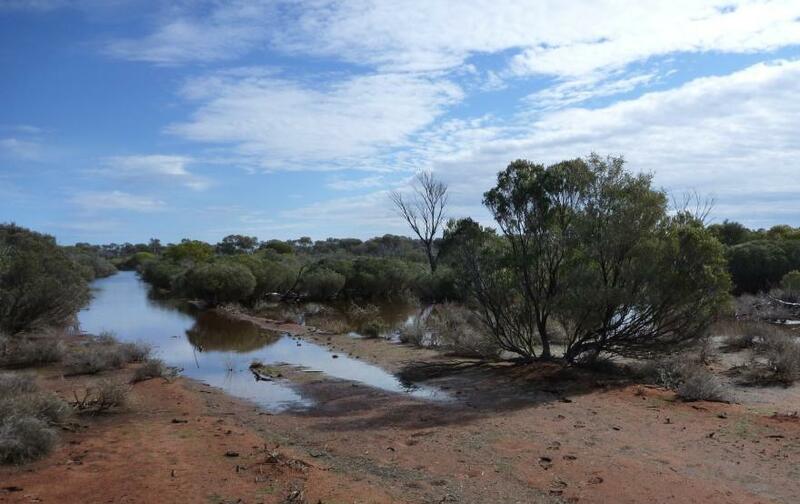 If it rained quite some time ago then the surrounding country should be dry enough and you may be able to drive around the waterhole. 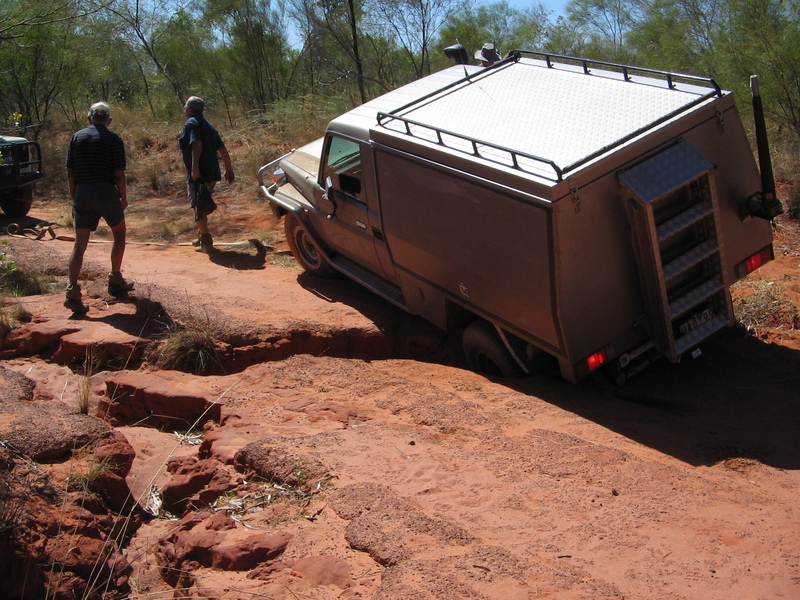 Caution is needed to avoid getting bogged, pull up and have a walk around the obstacle before making a decision. Sticking in the wheeltracks can be best sometimes - 2009. No choice but to go around this one, it was very soft - 2011. Avoid night driving if you can, camels often camp on the road during the night and because of their colour they can be very hard to see. 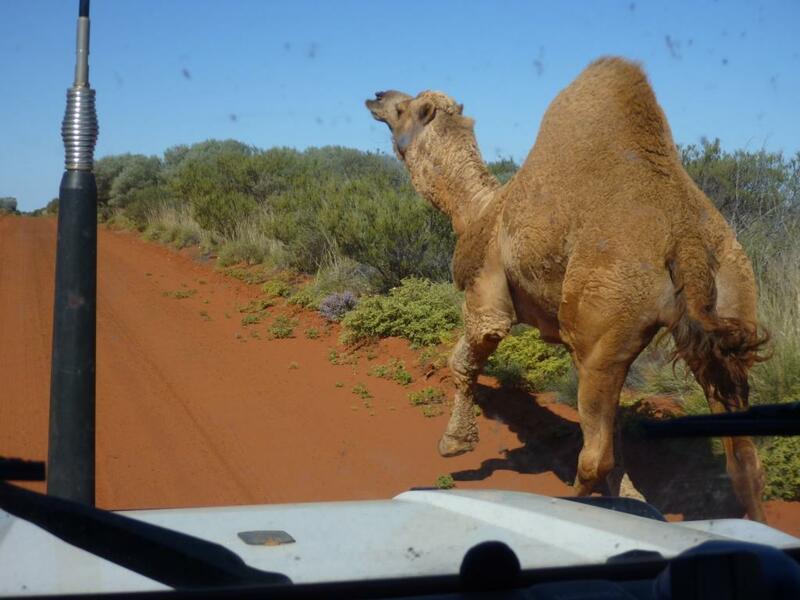 Bull camel in full flight (& fat), the road was wide enough to get around him – 2013. Well, they are the main concerns with travelling in the western deserts. Most things are no trouble if you are not in a hurry. Take it easy, keep your eyes open and have a think about the obstacles you encounter and you’ll have a good trip.